Boys, in their adolescent stage, generally experience facial concerns such as break outs on the skin, oiliness and acne. There are a lot of products that can help with these problems, such as lotions, creams and other cosmetics. One popular facial product is the face scrub. It really helps with acne and aids you to eventually have obtain a smooth skin after your adolescent years. It may be weird in the beginning for a guy like you to use facial products because this is something that girls are more known to be doing. But if you really care about your face, and want to have smooth and soft skin, even if you are male, then you need to invest in the right facial product with which your face will feel the most comfort. 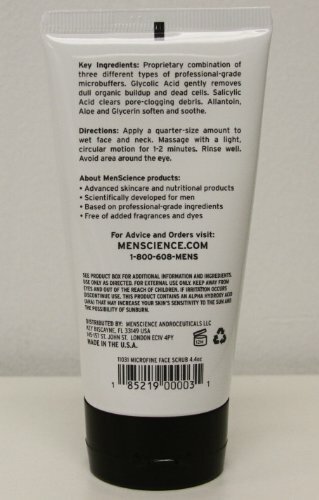 If you are clueless in the subject, you can start with the MenScience Androceuticals Microfine Face Scrub. The Men Science Androceuticals Microfine Face Scrub is the ultimate face scrub for the male of the species. It consists of a professional-grade formula, together with glycolic acid that gently rubs away dead skin cells. This, in turn, leaves your skin soft and smooth. It also helps prepare your skin for shaving. And yes, this is ideal for all skin types. Further, it makes your skin noticeably refreshed in less than a minute, as well as minimizes the chance of ingrown hairs and other irritations. Its special formula features 3 kinds of micro-fine buffing beads that aid you in achieving maximum cleansing. And since it removes dead skin cells and oily buildups, it brings out new cells after shedding and removing the upper layer of dead skin cells. Thus, you get to have healthy cell growth and a smooth and revitalized complexion. Experience a deep cleansing of impurities found within your pores with this face scrub. This product stands out from the others as it consists of a unique combination of physical and biological exfoliating agents. Moreover, it has a 5 percent concentration of unbuffered glycolic acid and a 1 percent concentration of salicylic acid, to encourage new cell growth and deep clean pores. And if you are the kind of guy who likes it rough, you will surely like this face scrub for giving you a typical coarse exfoliation. It contains a neutral smell—not too fragrant and not smelly either. There might have been a few batches of this product that were less than standard, since some customers noticed the difference in its formula. It was consistent with being a lotion, but lacked the ultimate scrubbing ability due to smaller and weaker microbeads; it was likened to being no different than a $6 face scrub. For those who prefer a more biodegradable scrubbing ingredient, this one may not be for you since it has polyethylene beds, which is a form of plastic. It may produce possible health and environmental hazards because of that. It also does not degrade and filter out in treatment systems. This may be a bit expensive compared to other face scrubs, but the MenScience Androceuticals Microfine Face Scrub is definitely worth the high price. It might be better to invest in something pricey, but is sure to take care of your skin more than a more affordable product. With this face scrub, you can put your full trust in it. It has just the perfect thickness for a satisfying scrubbing performance, and is guaranteed to leave your skin feeling rehydrated and rejuvenated. Also, it prepares your skin for deep cleansing and shaving, so it is like it has a dual function. Expect that your dead cells will also be removed, and enjoy soft and smooth skin. All these capabilities are certain because it has been scientifically developed for men, with the other obvious features, such as being fragrance and dye free. So what are you waiting for? Start scrubbing with this facial product to improve your skin quality and keep it looking rugged and handsome, yet feeling soft and smooth.